The TSC-1 board has been designed to operate two target signal heads, one for each end of a block or section of track. The TSC-1 board can also be used to indicate the position of turnouts. Each TSC-1 board can be controlled manually by the operator or operate automaticly when connected to other signal boards, block occupancy detectors or turnouts. 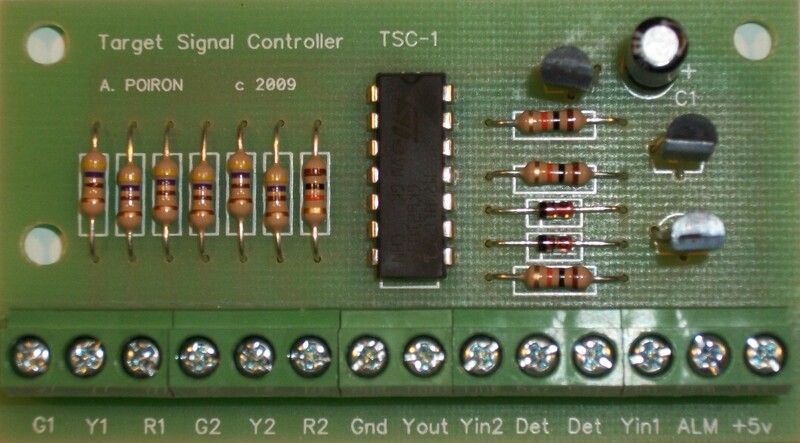 The TSC-1 board can also run independently or be tied in with other signal boards found on this website. There is no limit to the number of boards that can be connected together on a layout. * Operates two, 3 aspect signal heads. * Drives common cathode LED signal heads. * Can operate independently or with other signal boards found on this website. * Can be triggered from multiple sources. * Pre collision warning output. * Simple connections to other devices. Connections to the TSC-1 board are shown for several applications. 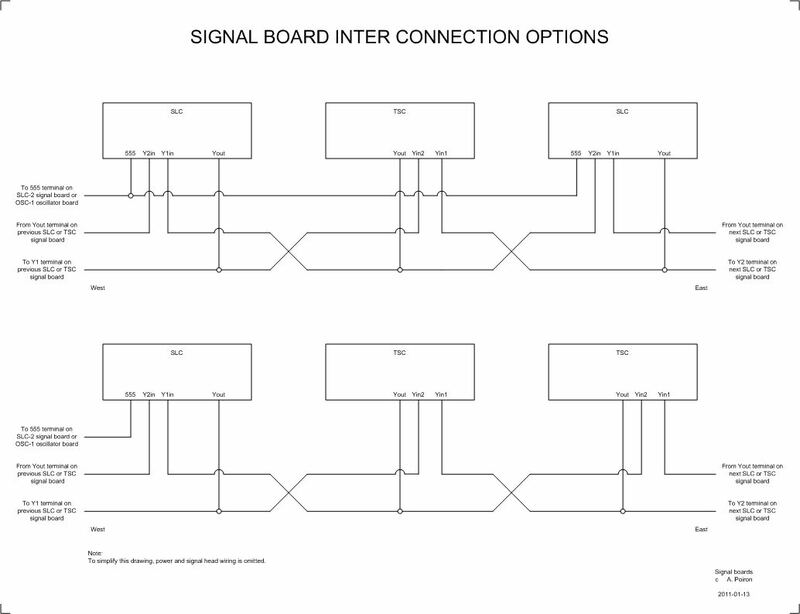 Boards can be connected independently or with other signal boards from this website. All connections should be made with the power turned off. If using only one TSC-1 board and the Yin1 and Yin2 inputs are not being used, they must be connected to GND to prevent false signaling. The TSC-1 board is designed to easily connect and work with other SLC and TSC signaling boards found on this website. The TSC-1 can be controlled from several sources in order to display an occupied block or approach signal. 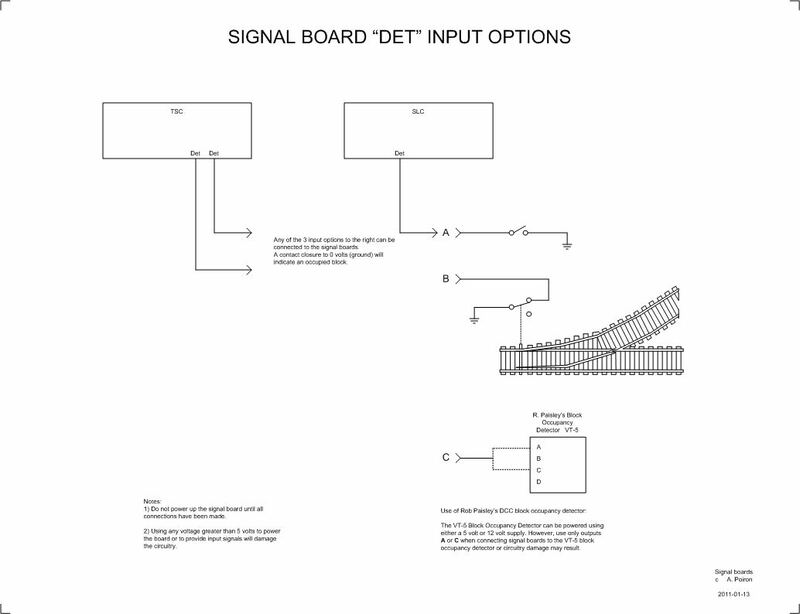 The use of a simple switch connected to the DET input will allow for manual signal operation. Although the turnouts are connected in the same way as a manual switch, it does provide some automation for operating your signals. A block occupancy detector which provides a logic low (ground) output works well with this board. 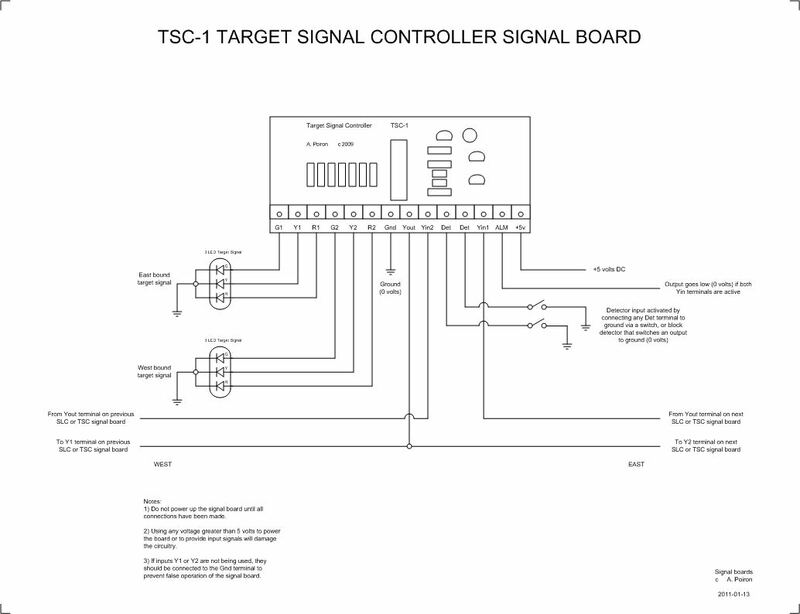 This is the recommended way to connect the TSC-1 board as it will provide a fully automated and realistic operating signal system. The TSC-1 board operates on 5 volts dc only. The use of any other voltage or supply will damage the circuit. G1 - Green LED for the first target signal. Y1 - Yellow LED for the first target signal. R1 - Red LED for the first target signal. G2 - Green LED for the second target signal. Y2 - Yellow LED for the second target signal. R2 - Red LED for the second target signal. Yout - Provides the yellow out signal to the previous and the next SLC or TSC board. Yin2 - Yellow in from the next SLC or TSC board. Det - Block detection input. Yin1 - Yellow in from the previous SLC or TSC board. +5v - 5 volt DC input. The signal board can operate independently or be connected to other signal boards found on this site.